We rode from Lansing to Joliet on two different days (late April, 2016 and May 22, 2016) as part of a cross-state adventure. My report plus pictures is on my blog at www.jeannemeeks.com under the Outdoor Adventure tab. 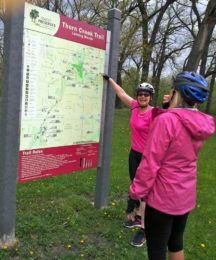 The blog post is entitled “Day 1 – Epic Bike Adventure” and covers the Indiana border through the Thorn Creek trail system, to the Old Plank Trail as far as New Lenox. “Day 2 – Epic….” covers from New Lenox, through Joliet, to the start of the I& M Canal.